The first of 20 stamps that will be released to commemorate the Harry Potter film series was released Tuesday by USA Today. 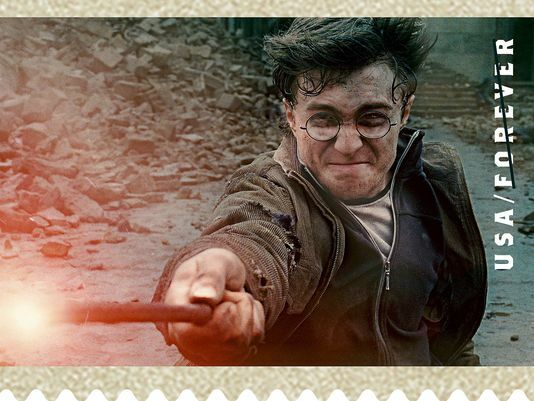 The image features Harry from the final battle in Harry Potter and the Deathly Hallows: Part 2; Warner Bros. stated that 20 individual stamps from all eight films will be released this coming Tuesday, November 19, by USPS. Five million 20-set stamps - including images of Dumbledore, Voldemort, and Fred and George Weasley - will be available for purchase of this limited-edition booklet. "Anyone who collects anything about Harry Potter will want this in their collection," [Susan McGowan, executive director of stamp services for the postal service] says. "We anticipate a big demand for these." "In the books and films, Harry Potter's life changed with a letter, so we couldn't envision a more fitting tribute to commemorate the world created by J.K. Rowling and brought to life in the Warner Bros. films," says Brad Globe, president of Warner Bros. Consumer Products. "We think fans around the world will share our excitement in seeing the films take their place alongside the most significant figures and events in history as part of the U.S. stamp program."